I put on a house show last weekend with four local bands and four touring acts. Since I had promised everyone a free meal, I needed to make a large amount of food. 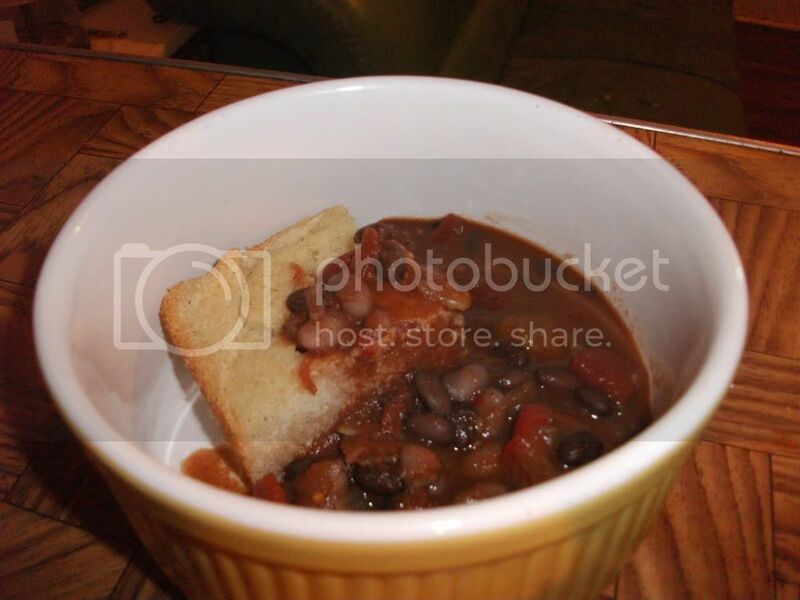 Chili is easiest to make in at least a gallon sized batch, and I decided to try and challenge myself to make up a vegan cornbread recipe. There were no leftovers, and it was really affordable. If you don't have twenty people to feed, you can freeze the chili in single serving containers, and live off of it for weeks. I know, because I've tried. Preheat the oven to 450 degrees. Spread the four tablespoons of canola oil in a 9"x12"x3" pan. Place the pan in the oven, and allow the oil to warm. In a large bowl combine the baking powder, sugar, white cornmeal, and salt. In a medium bowl stir the soy milk, apple cider vinegar, and half-cup of canola together. Add the wet ingredients to the dry ingredients, and mix thoroughly until smooth. Remove the pan of warmed oil from the oven, and pour the batter into the pan. Bake for 20 to 25 minutes, or until you can insert a knife and remove cleanly. Wash and rinse the dry black beans and dry white beans. In a large container, allow the beans to sit in 8 to 10 cups of water for at least six hours. Drain and rinse the beans. In a large pot, bring the beans to a boil in 8 cups of water. Reduce heat, and let simmer. Wash and chop the onions, squash, red bell peppers, and yellow bell peppers. Stir in the chopped vegetables to the pot of beans after it has simmered for about an hour. Continue simmering for about 30 minutes. Add the canned diced tomatoes in puree, canned chipotle peppers in adobo sauce, chili powder, and salt. Stir thoroughly while returning to a simmer. Turn off the burner, and serve with the vegan cornbread.